Mayor John Tory's executive committee gave its stamp of approval to the latest staff report recommending ongoing engagement with Premier Doug Ford's government — and Tory said he won't commit to being for or against the "upload" until there's a formal proposal on the table. A chorus of voices chanting "save our subway" filled Nathan Phillips Square on Thursday morning as protestors called on council to fight the province's plans to takeover Toronto's subway system. A few hours later, Mayor John Tory's executive committee gave its stamp of approval to the latest staff report recommending ongoing engagement with Premier Doug Ford's government. Tory said he won't commit to being for or against the "upload" until there's a formal proposal on the table. "This is the beginning, not the end," the mayor told a room filled with councillors, city staff, and community members. But with the province expected to introduce legislation "rapidly" — as early as later this year, according to the report — critics are questioning the process and the lack of concrete details shared so far. A York University professor and transit advocate with CodeRedTO, Patricia Wood said the timelines still aren't clear. Nor is what specifically the province plans to introduce through upcoming legislation, she said. "Everything's in quite a hurry, with very little information," Wood told CBC Toronto. Provincial ownership of the entire subway network. Provincial ownership of only future subway expansion. Some kind of realignment of transit responsibilities like funding and governance. City staff are expected to report back to council on the risks and benefits of those options. In a January interview with CBC Radio's Metro Morning, transportation minister Jeff Yurek drilled down further, saying the province's plan is to take over the planning, building and maintaining of subways, while the TTC would run the day-to-day operations for the entire system. Public consultation is meant to be part of the process, but so far a timeline for those discussions hasn't been released. At Thursday's meeting, Coun. Ana Bailao called for those dates to be provided by city staff at next week's council meeting, along with an advertising plan — a request backed by her fellow members. Coun. Michael Thompson also put forward a motion, later green-lit by the committee, which encourages council to request the province to publicly release a report to cabinet from Michael Lindsay, the special advisor handling the "upload." Yurek, in January, had noted cabinet minutes are confidential but said details explaining Lindsay's advice and the costs will be "made public." Other attendees raised concerns that a potential break-up of Toronto's transit network could have a negative impact on riders. 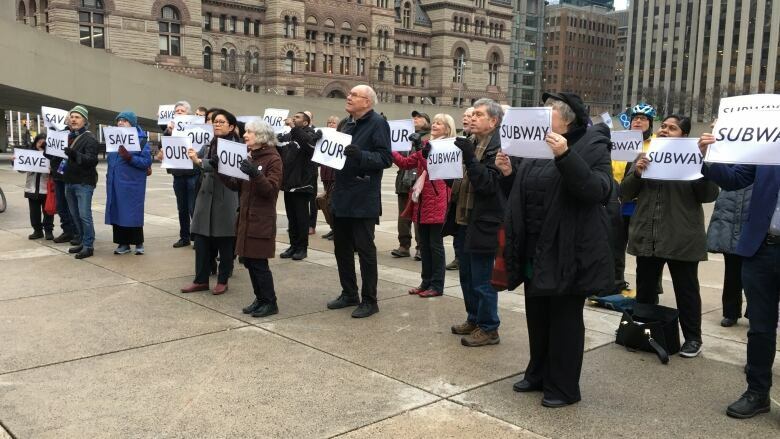 "A subway fragmented from its bus system does not benefit transit riders anywhere," said community member Mosheh Herdsman, a "lifelong" transit user and Progress Toronto member, during a deputation at the meeting. Transit user Helen Lee, a member of the TTCRiders advocacy group, called the province's plan a "theft" of public assets. And while she praised Tory's approach to not pick a side just yet as a "balanced" position, she stressed that council as a whole needs to fight back. "Our elected leadership should also step up and defend Toronto as much as they can against a provincial government that is, frankly, very hostile to the city of Toronto, and has been since they've taken office," she said. The Ford government has maintained the proposed upload would be beneficial for the city and could speed up transit planning, including projects like the downtown relief line and Yonge subway expansion.